Cabo Roig Holiday Villa – Beautiful 3 bedroom bungalow style holiday villa currently available to rent in the Costa Blanca, Spain resort of Cabo Roig. This well presented and tastefully furnished villa is located in the popular complex of Aldeas de Aguamarina I, and has view to the sea from the bedroom balcony. The villa is north-east facing so keeps quite cool during the hot summer months, it has a double bedroom upstairs with en-suite shower room and balcony with sea views, 2 twin bedrooms on the ground level, it can accommodate up to six people in comfort and has a decent sized garden with BBQ and furniture for al fresco dining. The villa is just a few yards walk from the pretty community pool, and is close to local facilities and seafront. Weekly holiday rentals are on offer from 275 euro. Get full details here: Cabo Roig Holiday Villa. Cabo Roig Apartment for Rent – Just one of our great selection of holiday rental properties in Cabo Roig on the Orihuela Costa, Costa Blanca, Spain, this 2 bedroom apartment is in the secure gated complex called Aldeas de Aguamarina I which is located in C/Agua, Aguamarina, Cabo Roig. An excellent and popular apartment which is available for holidays in Cabo Roig, this property can accommodate up to 7 people at a squeeze, using double bedroom, twin bedroom, double sofa bed and single pull-out bed. The apartment is air-conditioned and has a decent sized terrace, so you can sit and eat outside to make the most of the wonderful climate. The apartment is within easy reach of restaurants, bars and shops, and also the seafront promenade which is only a couple of minutes walk away. The main beach and marina are a little further to walk, but no more than 10 minutes. The communal swimming pool which you can use when renting this apartment is a good size and very attractive along with pretty garden areas. Holiday rentals start at just 175 euro per week, and the advice is to book early to avoid disappointment. You can get full details of this Cabo Roig apartment for rent here: Cabo Roig Apartment for Rent. We also have an apartment for sale in the same block if you are looking to buy property in this popular area, you can find details of this apartment here: Cabo Roig Apartment for Sale. Click on the “Cabo Roig” tag to get lots more information on cabo Roig and other property for sale and rent in the area. 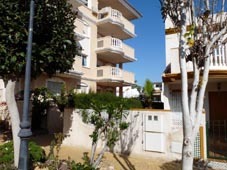 Desirable ground floor apartment currently available for long term rent in the Orihuela Costa resort of Punta Prima on the Costa Blanca, Spain. Located within walking distance of shops, bars and restaurants, and also just a short walk to Punta Prima beach. This fine property in Punta Prima is fully furnished and equipped with satellite TV, air-conditioning, alarm, underground car parking space, communal swimming pools, communal gardens, and enjoys a south facing sunny position, perfect for enjoying the warm weather. The property faces a road, but this is a very quiet road in a tranquil residential area. This Punta Prima rental apartment is available on a long term basis for a rental of 575 euro per month and would also be considered for holidays at the right price. Punta Prima is to the south of Torrevieja and is on both sides of the N332 road, this specific property is on the inland side of the road on the La Cinuelica complex.